Last month, the RBNZ gave an explicit easing bias to suggest that it’s likely to cut overnight cash rate (OCR) again. The central bank said: “Given the weaker global economic outlook and reduced momentum in domestic spending, the more likely direction of our next OCR move is down.” Today’s data further supports the view that the central bank could cut the COR as early as May. The New Zealand Dollar fell by one full US cent immediately before the release. The combination of strong Chinese data beating expectations and weak New Zealand CPI also gave AUDNZD a strong push higher. 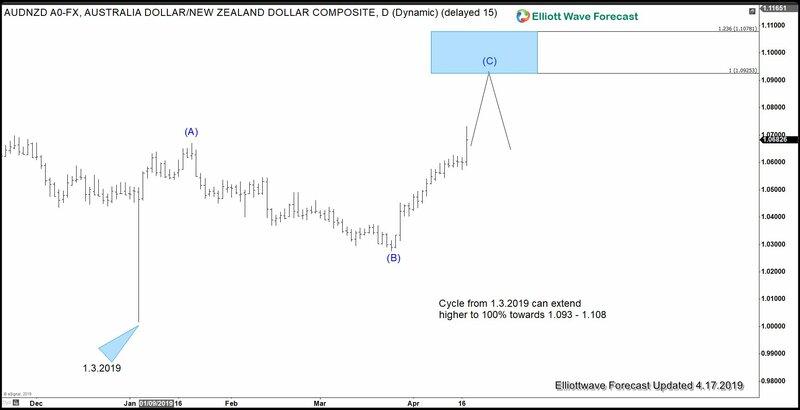 AUDNZD shows an incomplete bullish sequence from 1.3.2019 low favoring more upside. The rally looks to be unfolding as a zigzag Elliott Wave structure. Pair can continue to extend higher within wave (C) towards 1.092 – 1.108 which is 100% – 123.6% Fibonacci extension of wave (A). Pullback should now hold above wave (B) at 1.0276 in 3, 7, or 11 swing for further upside. Technical outlook of AUDNZD therefore also supports a weak New Zealand Dollar. The 4 hour chart above shows the internal of wave (C) of the zigzag from 1.3.2019 low. The internal subdivides as a 5 waves impulse Elliott Wave structure. Up from wave (B) low at 1.0273, wave 1 ended at 1.0338 and wave 2 ended at 1.03. Wave 3 rally is in progress and also subdivides in 5 waves of lesser degree. Expect pair to continue to find support in the dips in 3, 7, or 11 swing as far as pullback stays above 1.027 low. Alternatively, structure could become a double three structure in which pair would make a bigger 3 waves pull back to correct the cycle from 1.0273 low before making next push higher towards 1.0930 – 1.108 area and find sellers there. A soft CPI data increases the chance of a rate cut by RBNZ next month. The central bank has given the hint of further easing last month and today’s data may seal the deal. 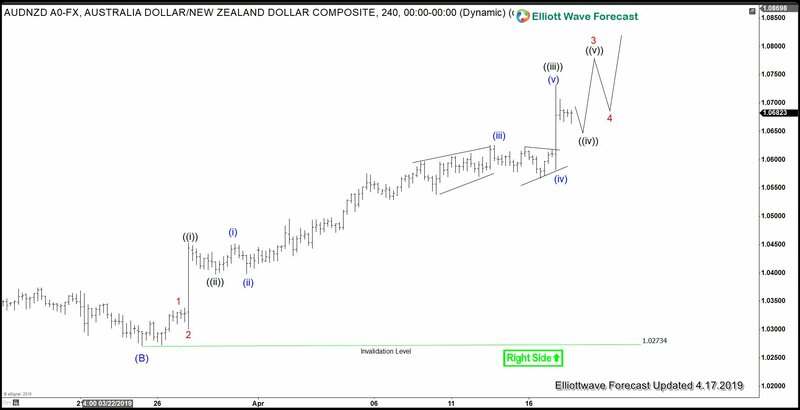 From technical side, Elliott Wave view in AUDNZD supports further upside in the pair while above 1.027. This technical outlook aligns with the fundamental view that New Zealand may weaken due to expected OCR cut. Keep in mind that market is dynamic and the view may have changed since the writing time of the article. For the latest technical update in AUDNZD and other instrument, feel free to take the 14 days FREE trial.